Veterinarians Asked To Euthanize Animals Inappropriately Feel 'Moral Distress' : Shots - Health News Most of the 800 veterinarians surveyed feel ethical qualms when pet owners ask them to euthanize animals that could be treated, or when owners ask to keep pets alive who will suffer needlessly. 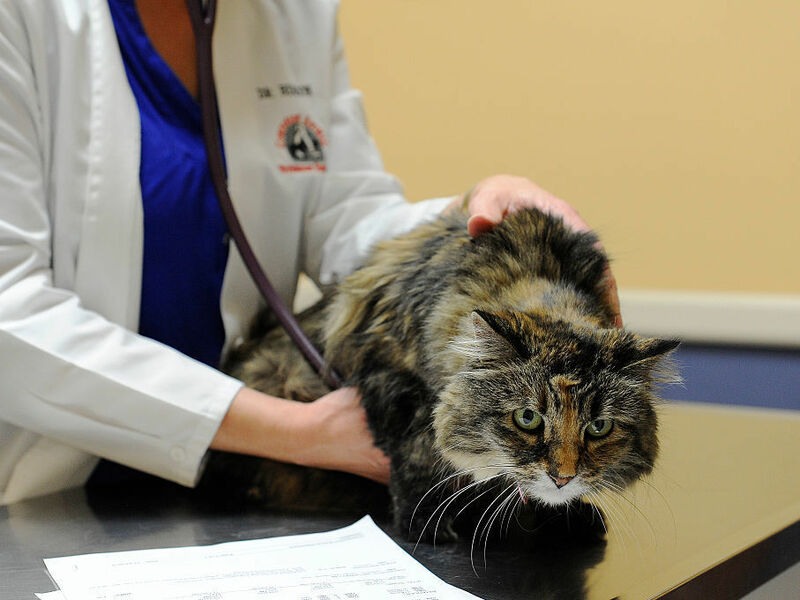 The authors of a new study on veterinarians and mental health say vet school should include more training on how to cope with the moral distress vets face when asked by pet owners to do things that are against their medical judgment. Distress around choices such as those is pervasive among vets, Moses and her colleagues found. For example, 69 percent said they had felt moderate to severe distress about not being able to give animals what they thought was the right care. Almost two-thirds were bothered by inappropriate requests for euthanasia. The study's senior author, Cambridge Health Alliance psychiatrist and Harvard bioethicist J. Wesley Boyd, sees a connection between the study's findings and daunting statistics about veterinarians' suicide rates: "My assumption," he says, "is that the findings from our survey are definitely part of, or even the majority of, the reason why veterinarians have higher-than-average suicide rates." And Moses says that while euthanizing an animal is often the right thing to do to end suffering, that doesn't make it easy. "I want to make a plea to the pet-owning public to understand that, no matter what you think, odds are the person who's trying to help you take care of your animal has pretty strong feelings about how important that is," she says. "And they feel it." The study's authors are calling for better training — in veterinary school and beyond — on self-care and how to cope with moral distress and ethical conflict. Sinnott-Stutzman defines moral distress as the feeling when the vet determines an optimal treatment course but is blocked from carrying it out — whether because of money, or an owner's beliefs, or rules about, say, dogs that bite. "The most poignant example is when a young dog has a fracture — so a totally fixable, non-life-threatening problem," she says. But an owner neither wants to pay for a proper fix nor have a three-legged dog, and opts for euthanasia instead. "That's a really tough thing to go through," she says. It's also particularly hard, she says, when owners, caught up in their grief, project their anger onto the vet. "So in this example," she says, they might say, " 'We have to kill our dog because you're all about the money,' which is of course not the case." In her 15 years doing emergency and critical care, Sinnott-Stutzman says, she has changed how she copes with moral distress. In the past, she would mainly talk tough cases through with colleagues. Now, she often tries to refocus her mind — meditate, take a walk, think about her kids. She might share an experience with her husband — who will focus on her feelings — rather than a colleague, who is likelier to focus on the medical aspects. She strongly endorses the study authors' call for better training for vets in how to handle moral distress. Everything she has learned about coping has come from mentors and friends outside the veterinary profession, she says, and "it absolutely needs to be part of how we teach vets." Carey Goldberg is the editor of WBUR's CommonHealth blog.